Ash Wednesday is March 6. Nest’s “Worthy is the Lamb” DVD covers Jesus’ last days in Jerusalem. Son of God (2014) Print my free outline to the Son of God movie. Includes discussion questions. Open the following “toggle” to see my notes for two fun children’s sermons about all the ROCKS and stones found in the Holy Week stories, and about celebrating Easter on April Fool’s Day in 2018. I’ve moved this long post to its own webpage. Enjoy! Ascension from the rocky Mount of Olives. A sermon and children’s sermon outline. See it in full at my SundayResources.net blog. I’ve done this several times: You pick out a key verse from the Ash Wed or Lenten lectionary readings, and treat them as memory verses in the computer lab. You can also create your own list of key Lenten verses for the kids to learn. Using various software, you can then study these in a special Lent computer lab lesson, or tackle them at the END of another lesson. Cal and Marty’s Scripture Memory Game CD is often used, but you can use other software as well. Mark 8:31 is a wonderful MEMORY VERSE that’s a PUZZLER question too. “Whoever wants to be my disciple must deny themselves and take up their cross and follow me. What good is it for someone to gain the whole world, yet forfeit their soul?”. For whoever wants to save their life will lose it, but whoever loses their life for me and for the gospel will save it. The Lesson Idea: After reading and discussing these verses, have the kids INPUT THEM into Cal & Marty’s Scripture Memory Game’s VERSE EDITOR. DO NOT do it for them! Typing verses into the editor is part of their memorization process, and they like to do it! After they create the memory verse in the Cal & Marty game, they have the option to create a three question QUIZ that goes with the verse. GIVE THEM the questions they are to use, but have THEM create the possible answers. After everyone has created their memory verse and quiz, switch computers so the kids can play the verse & quiz made others. What does it mean to “deny yourself” ? What does it mean to “take up your cross and follow” Jesus? How are you denying yourself this Lent? What part of your life do you think God wants you to get rid of? As a follow up or alternate activity, have the kids use Let’s Talk CD’s “Talk Now” module to do a lesson activity I call “HOW FEW CAN YOU DO” …a fun challenge directed by the teacher to have the kids REDUCE the passage to its essential vocabulary. This is a favorite lesson activity of mine for complex or long passages. See my lesson examples of “How Few Can You Do” detailed in the More Lesson Ideas page for Let’s Talk CD. You can also see my “How Few Can You Do?” lesson outline below on this page in the Philippians 2 lesson idea. We used Cal & Marty Scripture Memory Game CD, had the kids add a quiz about the verse and then switch computers and play each other’s Cal scramble and quiz game. Spent a lot of time unpacking the word “ambassador” too and coming up with “What Would Ambassador Do” answers to scenarios kids face in their lives. In 2013 the lectionary has Psalm 51:10 “Create in me a clean heart, O God, and put a new and right spirit within me”, which is another great memory verse. Did you know they (used to) put ASH IN SOAP? Sounds like a soap-making project to me! Create self-portraits in Kid Pix illustrated with an “ash smudge.” Have the students type over their portrait a sentence or two explaining why they have ashes, and answers to other possible questions you have discussed with them in your study. For example: “When I wear the ashes, it makes me remember this… about Jesus.” “Wearing ashes, I want others to know I’m a Christian today because….” Print their portraits and hang in the church hallway. Alternately, you could use Let’s Talk CD’s “Lesson Builder” module to have the kids make a short presentation w/quiz about why they wear the ashes. These verses are “the Gospel in miniature”. They explain the cross and Christ’s purpose, and our expected response. It’s a great passage to teach kids. See my lesson sketch for Philippians 2:5-11 here! The lesson sketch includes a link to my Philippians 2:5-11 downloadable memory verse SET for use with Cal and Marty’s Scripture Memory Game software. The sketch also includes my lesson plan for that set, my study notes for the verse, and a lesson outline for the game “How Few Can You Do?” using Let’s Talk CD on Philippians 2:5-11. I love this art activity. You order the plastic plate kits from www.makit.com, have each kid design their own Seder-Passover Plate, and within 2 weeks you get back durable plastic plates with their design on it. BTW: What’s found on the Seder/Passover plate is found in two games in our Jesus in Space CD on the Planet Whammo. Here’s another idea for you: Conduct a kid-friendly Seder/Passover meal on Sunday morning and have the kids invite a friend to join them. Dress up. Here’s my Seder~Passover Script that I posted over at rotation.org. How Well Do You Know the Story of Holy Week? TIP: You might play this BEFORE Holy Week so you know what parts your lessons need to emphasize. How Well Do You Know the Story of the Last Supper? Jesus in Space CD’s Last Supper lesson on the Planet Whammo is essentially a QUIZ about the story order. There are a surprising number of pieces to it. The robots try to get it straight, but Lt. Stu must also decide if the robots are wrong. If either gets it wrong you find out why they call it the planet “Whammo” ! Maps are a great way to do that. Click open the toggle below to see a screenshot of the “Last Two Days of Jesus in Jerusalem” from the Life of Christ CD you can save and use with your kids. I’ve blanked out the location names. Kids have to fill them back in as they take the map tour in the program. RIGHT click my map graphic and SAVE to your computer for printing. 1. Go to the Professor’s Bookshelf in the Life of Christ CD and click the “Practice” book. Click on the “Tour…Passion Week in Jerusalem.” This is a narrated map of Jerusalem that traces Jesus’ last days with eight audio clips to hear. 2. Click and hear the events in the order you believe they happened. Fill in the location names on your map as you move through the events of Jesus’ last days. Then trace his route through the city on your map just as the program traces it. It get’s a little complicated between Pilate and Herod. See if you can figure it out! 3. When finished with the tour, answer the questions below. a. What one word might describe Jesus’ emotions at each location? Think about what was happening to him at each spot and list that one word next to each location. b. How would you describe the Disciple’s behavior in the last days of Jesus’ life? c. Why did they act like that? d. Why did the leaders and priests want to get rid of Jesus? What were they afraid of losing or happening? e. What could you have said to the leaders to convince them to release Jesus? Developmentally speaking, the little dudes don’t conceptually understand maps the way older kids and adults do. But they CAN trace a map and REMEMBER what happened where, –which is all we’re really looking for, even if they don’t understand that the map is a 2d representation of a real place. They can also understand the FEELINGS at each location (what was Jesus feeling at Caiaphas’ house?). So after using Play & Learn Children’s Bible CD -which has several Holy Week short stories in it, I have them DRAW MEMORY FLASH CARDS of the various events, then play a sequencing game with their pictures (really kind of like a picture puzzle). Those Flash Cards can include drawings of bread, cup, dinner, lamb, garden, prayer, –to help them sequence the PROPS of the events. And as you play the game… You can discuss each one, reinforce each one. One year I created a list of the names, vocab, and strange place names found in the Holy Week stories of all four Gospel’s. This comprehensive list should be taught through games, quizzes and puzzles to improve student’s familiarity and comprehension of these important stories. Stories are stickier and more quickly learned when they’re less confusing to read and hear. Yet, the Holy Week stories are full of new names, strange place names, and challenging vocabulary words. To improve familiarity, recall, and comprehension of these important stories, each year many of us in Sunday School create quizzes, wordsearches and crossword puzzles. In the computer lab, that means using programs like Fall of Jericho or Bible Grand Slam CDs, which many of our customers already own. Or Bible Crosswords/Wordsearch CDs (now out of print). The thing I like about this list, is that in learning it, –it opens up all sorts of opportunities to dive into the story. Note: Several of these words appear in more than one Gospel, and thus, are only listed once here. Create multiple choice question sets and race to Jericho! Ilumina Bible software’s Narrated Holy Week Animations. Ilumina Bible DVD is out of print, but if you own it, it has a WEALTH of narrated animations centered around Jesus’ ministry and Holy Week. If you own it, you could combine it with your Life of Christ CD lessons. Toggle this open to see the list and some suggestions. These match up to Life of Christ CD’s lessons 31, 33, 34,35. The animations could be viewed after that interactive lesson in Life of Christ CD. You could create a worksheet with questions to answer following the viewing of one of the animations. Ilumina is now out of print, but many of our customers still own it. Note: Ilumina’s depiction of Jesus on the cross shows him with quite a bit of blood. Might be a bit graphically intense for younger children. Each animation lasts about two minutes. with either Crosswords and WordSearch CDs (now out of print), or Cal & Marty’s Scripture Memory Game CD. The 7 Last Words teach children the extreme grace and obedience of Jesus at the most profound moment in all of history, and most difficult moments of his life. They are especially personal words which further reveal the love and humanity of Christ. This is a good lesson for that “special Sunday” or an upcoming Wednesday Night program. It also makes for a good special lesson for teens coming into the lab. Older Children and teens should TYPE IN these verses to the Crosswords/Wordsearch game or Cal & Marty verse editor. They enjoy “programming” the game and the typing begins the memorization process. Early Readers can easily learn the Last 7 Words in a Word Search or Scripture Memory Game. While they may not be able to “read” these short verses, then can identify key words by the SIGHT AND SHAPE of the words. You can also put the 7 Last Words into “new words” or “with explanation” using Let’s Talk CD …the program which “speaks aloud” whatever the kids type through their onscreen animated character. Let’s Talk Lesson Example: After Bible study, the teacher invites the kids to turn on the Lesson Builder Module in Let’s Talk and create a brief “introduction” to one of the “last words” –typing the last words, and explaining what they mean to the student, what they say about Jesus, what they tell us about the cross. Then the Lesson Builder Module invites them to add 3 quiz questions and 3 discussion questions. When they’re done, have the kids SWITCH to another computer workstation to view each other’s presentations. Example quiz questions: In which Gospel do you find this “last word”? Luke, John or Matthew? Who does Jesus seem to be saying these last words to? Example of a discussion question: What do you think Jesus is feeling at the moment he says the words, “It is finished”. Happy? Sad? or what? Depending on your number of computers/stations or amount of time, you may have already created some “Last Word” presentations in advance. For example, if you only have 3 computers and are short on time, you could pick 4 of the Last Words and do them yourself ahead of time, and just have the kids at the 3 computers make presentations for the other 3 Last Words. Or, you could have your teens come in one week and MAKE the 7 Last Word Presentation/quizzes in Let’s Talk for the younger grades. Most of our customers have the Life of Christ CD which has MANY Holy Week story presentations in it. We have also created a new program to follow-up these presentations in Life of Christ. I first thought up Let’s Talk CD after using Life of Christ for many years wishing I had a “dig deeper/reflection” program that would come after we viewed a presentation in Life of Christ CD. See some great lesson examples of that below. Mary believed Jesus when he said he would be crucified and wanted to show she loved him. What can you do to show your love for Jesus? Why the Jews and Caiaphas plotted to get rid of Jesus. Has jealousy ever made you say something that hurt others? The prophetic prediction behind the act. Jesus sobs over Jerusalem (and why). Do you honor Jesus as your king? If so, how? VOICES/opinions in Let’s Talk –which animated characters will speak aloud. Children there that day, old people, priests, romans, soldiers, sinners. What did they shout? What were they thinking to themselves? What questions would they have wanted to ask? What was Jesus thinking? What would the STONES have shouted, had everyone been silenced? Why people needed their money changed. People misusing the Temple. Children sang praises. When and how do you praise the Lord? An good presentation on the history and practice of the Passover meal and how Jesus redefined it. Have you ever taken Communion to remember Jesus’ death? Raphael in Pathways Through Jerusalem discusses the events of that evening. Play and Learn Children’s Bible CD has a “Last Supper” story for non-readers/early readers. You could use Fall of Jericho Quiz game CD to follow up any of these programs on the Last Supper. Create a question set about YOUR church’s particular Communion Liturgy, the words/phrases you use, what happens when, what we do and what we don’t do. NOTE: “Jesus in Space“ covers the Lord’s Supper & Foot Washing as a full interactive animated lesson. Jesus, the crowds, the priests, the soldiers, and Pilate. Have you ever been accused of something you didn’t do? For those of you who own the now-out-of-print Footsteps of Jesus CD and Pathways CDs… Gethsemane is featured in Footsteps of Jesus CD and both Helena’s and Raphael’s Pathways Through Jerusalem CD tours. King Herod tours the reconstruction of Caiaphas’ house (the Palatial Mansion section) in Pathways Through Jerusalem. King Herod’s Tour in Pathways Through Jerusalem shows the Lithos Stratos pavement where Jesus was scourged. Use Let’s Talk CD as a follow-up to this lesson. Have students create a ‘speech’ by the different characters as to what they saw and why they wanted Jesus out of the way. Use Let’s Talk to create a defense. The “Conversation Now” module in Let’s Talk is like an “instant messaging program” in which two antagonists can argue about the events and reasons. Explanation of cross, Calvary, the sign, meaning of some of his last words. How would you have felt watching Jesus die? Alive Forever and Ever. The lesson’s question “How would you have felt….” can be answered by your students through Let’s Talk CD’s ability to create animated characters who voice student thoughts. You can also have them build their own lesson on this subject in Let’s Talk. Footsteps of Jesus and Queen Helena’ and Raphael’s tours in Pathways Through Jerusalem both have extensive material of the Church of the Holy Sepulchre/Calvary/Cross. Related: See Neil’s “Last 7 Words of Christ” lesson idea here on this page. The women discover the empty tomb. How would you have reacted? Footsteps of Jesus has a great photobubble of the Garden Tomb. It also has a section titled “Gordon’s Calvary” which is good. Use Let’s Talk CD and create your own lesson presentation for the kids to hear and respond to about how they would feel seeing Jesus crucified and buried. Or have the students create the lesson using Let’s Talk’s Lesson Builder. It’s a great way to learn the story “in their own words.” In one of your spoken-aloud discussion questions in Let’s Talk presentation, ask the kids to give voice to places where they can see the resurrected Christ today.35. Resurrected Messiah Visits Friends and Followers (Luke 24:13-44) The road to Emmaus story. Why shouldn’t the disciples have been surprised at Jesus’ resurrection? How would you have acted? See Jesus in Space CD for an awesome interactive lesson about ROAD TO EMMAUS. Jesus Christ Superstar, the movie, has a great scene and song of the entry into Jerusalem. Print my free Teaching Outline to Jesus Christ Superstar here. How did Thomas explain his doubt to others? What did Peter say to apologize to the rest of the Disciples? These kinds of question spark discussion and help students REFLECT on “the rest of the story” not recorded but imaginable! Let’s Talk CD allows your students to create an onscreen character and make him talk out loud, –responding to any question you put before your students. What SHOULD Peter have said to the people in the courtyard… instead of wimping out”?? To start off, I the teacher took the role of the PROTAGONIST. I stood in the middle of the room and accused Peter of being a disciple -to which the kids had to respond through their Let’s Talk onscreen character –as if Peter had defended himself instead of denying Jesus. “Why shouldn’t I turn you in too!” Third graders can easily use it, but even non-readers love using it IF they have someone helping them type their responses. They love hearing the computer speak to them. Let’s Talk can be use for any subject, and has several different WAYS it can be used, including building lessons that speak aloud, only simulating “instant messaging” on your computer. Let’s Talk can be used in SO many ways. I hope you enjoy these lesson starters. How do we “see” Jesus today? How can we help others “see” and believe in Jesus?Old-timers will recognize the famous photo of “Jesus in the snow” used in this resource. I came across it decades ago in a youth resources. When we made our Jesus in Space CD, we got permission to include the photo in an INTERACTIVE lesson about “how we ‘see’ Jesus” and “how others need our help seeing Jesus.” So many discussion possibilities! Whether you’re using our Jesus in Space CD, or simply using our PRINTABLE VERSION of the photo and lesson, it makes a wonderful children sermon or children’s lesson. I have even used it in a sermon with adults to great effect. Use it with Luke 24, the story of the disciples “seeing” (or not seeing) Jesus on the Road to Emmaus. See a discussion of the photo/lesson here and print the photo of Jesus in the Snow. This is one of my favorite children’s sermons for the weeks leading up to Holy Week. Early in the service, you’ll give the kids a very special cross kit, and then (as we do in MY church at least), send them back to their seats and invite them to “finish” the cross with the yarn we gave them DURING THE ADULT SERMON. After the sermon, you’ll ask the kids to raise their crosses for all to see. If your kids leave and don’t come back, invite them to bring their crosses to the coffee hour. Cue the adults to pay attention! Update: The next time I did this cross children’s sermon in another church, we simply gave each kid a wooden cross and baggie of colored yarn with instructions which included what the colors of yarn represent. After worship, several adults asked us if we had any extras!. The finished product will look like a god’s-eye cross, but a little more substantial. I had a retired fellow make these crosses which the kids wrapped with yarn. They loved that, and it was an extra bonus connection for the gentleman we asked to provide them. Alternately, you could just tied together two pieces of wood/dowel like a traditional “gods-eye” craft, but we were looking at giving crosses that would go home and be cherished. We also wanted the NAILS to be part of our project. Update: Wooden crosses can also be purchased online. Try Oriental Trading Co for starters. 1. Cut and sand two pieces of wood to form a cross approximately 8″ high and 4″ wide. (Our retired fellow even stained them.) Use 3/4″ x 1 1/2″ stock wood. 2. 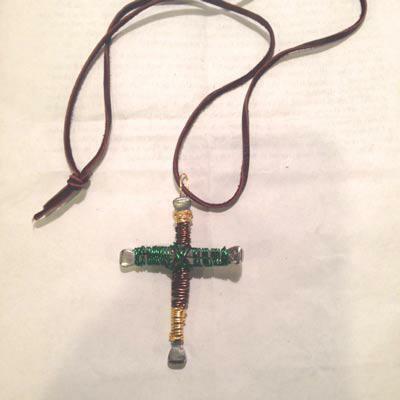 Use a small screw and dab of glue to fix the two pieces to each other in the shape of a cross. 3. NAIL a small nail to each end of the cross: head and toe, left and right so that it’s sticking out from the ends. 4. Pre-cut quite a lot of 4 foot lengths of colored yarn and have them spaced out on a table where the kids can grab 15 to 20 strands to weave their cross. We also had some gold and black ribbon. 5. Hand out the crosses and then DEMONSTRATE weaving the cross, and AS YOU DO, you will TALK ABOUT WHICH COLORS REMIND YOU of something about Jesus’ cross. Purple = We hailed him as our King! Blue for tears. We didn’t understand, and we abandoned him. Brown “like dirt” because people thought he was going to stay dead. ETC… notice how I’m focused on the feelings the cross evokes. Kids get that. “Weaving” simply means tieing an end to one nail and then going to the next nail in any order or sequence. Some of the kids also WRAPPED their yarn around the wood. Some did a real gods-eye type of yarn wrapping, not just from nail to nail. Some wrapped the crux of the cross in yarn to cover the bolt. One used the ribbon as a streamer coming off the top nail! Quite a few took extra yarn after the service was over to complete their crosses at home (especially once they saw what others had done). 6. Supervise the distribution of the yarn/ribbons, give them instructions about WHEN and WHERE you’ll be looking for their completed crosss, then send them on their way. If your kids stay in the service to weave, reference its meaning in your sermon and stop in the middle of your sermon to ask how they are doing! If you brainstorm an improvement on this, let me know. Hey! Here’s my NAIL CROSS ART PROJECT we did at my church. Purim is the last party before the Passover season and is something of a “Jewish Fat Tuesday” and Halloween. Purim usually coincides with the first weeks of Christian Lent. PURIM has been described as “the Hebrew Mardi Gras” and “The Jewish Halloween.” Among other themes, Purim celebrates God’s saving acts. Many synagogues hold big parties or carnivals at this time. Celebrating the victory of Mordecai and Esther over Haman and King Xerxes, celebrants dress up in costume and re-enact the story, shouting “boo” whenever Haman’s name is mentioned. Buffoonery and joking are accepted practice during this festival to mock Haman and all those who would oppose God’s will. Our Awesome Bible Stories CD has a GREAT Story of Esther section in it, complete with a button your kids can click to BOO HAMAN every time they hear his story. The CD also has a videoclip of a typical Purim celebration and carnival in a US synagogue.